Fall prevention among the elderly and less mobile is always a concern for family and carers. Trips and falls are of particular concern not only for those who live alone but also for those in care facilities. While preventing falls is always the number one priority what happens when a fall does occur? How can carers be alerted to ensure that help is given as urgently as possible? Fall detection is therefore also a high priority for the elderly, less mobile and those living alone or in care facilities. At HomeCare Technologies we have an unrivalled range of fall prevention and fall detection products designed to provide a safe environment for family members and those in your care, reducing the risk of falls and ensuring help can be summoned urgently should a fall occur. There are a range of fall detection products designed to alert carers when a fall occurs. Many require them to be manually activated by the individual and usually come in the form of a panic button or alarm pendant worn around the wrist, on a necklace or secured to clothing. 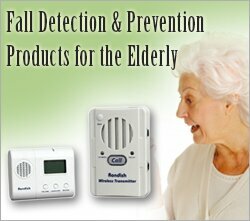 There are however more advanced fall detection products that are able to automatically detect a fall and alert carers. These products can include many additional features such as temperature warning, detecting unconsciousness and wandering alert. The alarm is raised and the system automatically dials pre-programmed contacts to alert them that attention is needed and the nature of the problem. Choosing a fall prevention or fall detection product requires a number of factors to be considered. If you would like help in choosing the right product please talk to one of our independent living experts today on 1890 344 344 or send us a message here.